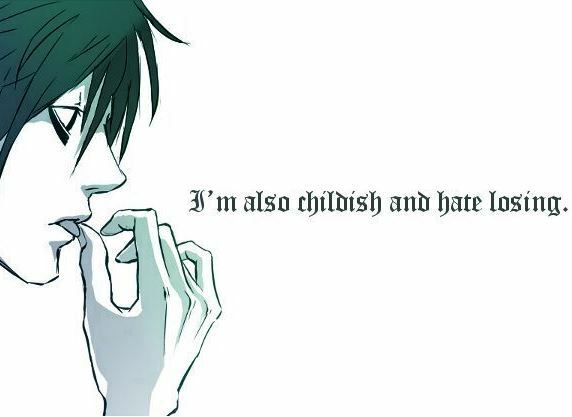 (not actually talking about Jadeite). Equivalent Anime Episode: err… most of them? Usagi gives the re-cap, this time with a heart-shaped inset! Cut to ANT-LION BERET sink-holing Mako! Rei and Ami accelerated split-screen transform! Sailor Mercury grabs Mako while Sailor Mars fireballs the youma. ANT-LION BERET dodges the fire by ducking into its burrow and vanishing. The two Sailors drag Mako out of the sinkhole, which then fills in and vanishes. At the Crown Karaoke Centre, Rei updates Usagi on what’s been going on. Usagi: “Because they’ll tease me!. Usagi makes up a tale woven from half-truths about how she was with Naru and the others when a Youma attacked. Mako sneezes, she’s apparently caught a cold. Ami smiles – it doesn’t reach her eyes. Usagi lies in bed, she just cannot stop thinking about Mamoru. ...not matter how much she tries! Next morning, walking to school. Ninja Naru out of nowhere! Naru, of course, wants to know how Usagi’s date with Mamoru went. Ami just stops, her smile fading. Usagi and Naru argue, playfully. Then Usagi spots Ami, and runs to drag her into the group. Naru… does not look happy. (Flashback to her confrontation with Ami two episodes ago). At which point Usagi gets tangled up in her own web of lies. Usagi drags Naru off to perform urgent damage control, leaving Ami alone. In school, English lessons, with Miss Haruna (whom we haven’t seen for a while). 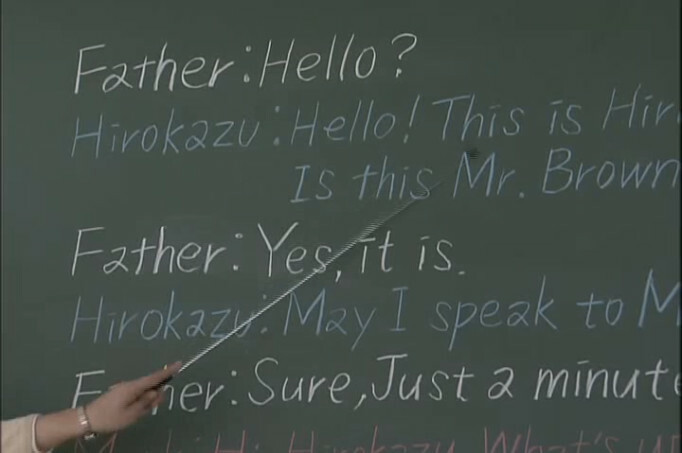 The class exercise is for the pupils to pair up and act out the conversation (in English). Naru turns to Usagi and suggests they pair up. Usagi suggests a group of three, including Ami. Ami points out that the conversation is for two, she’ll join with whoever is left over. Usagi jumps in to act as peacemaker. At which point Miss Haruna steps in. 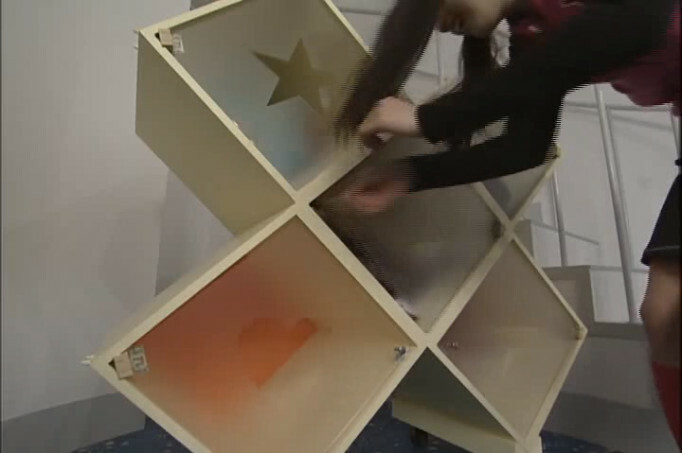 Haruna puts her foot down, and assigns pairs. Usagi with Hikoemon Yamamoto (who has a really deep voice). Usagi, who’s grasp of English is about as bad as ever, breaks off to reassure Ami about Naru. A!Mina, A!Rei, M!Mina and M!Rei collectively facepalm. We cut from this to…. THE DARK KINGDOM! 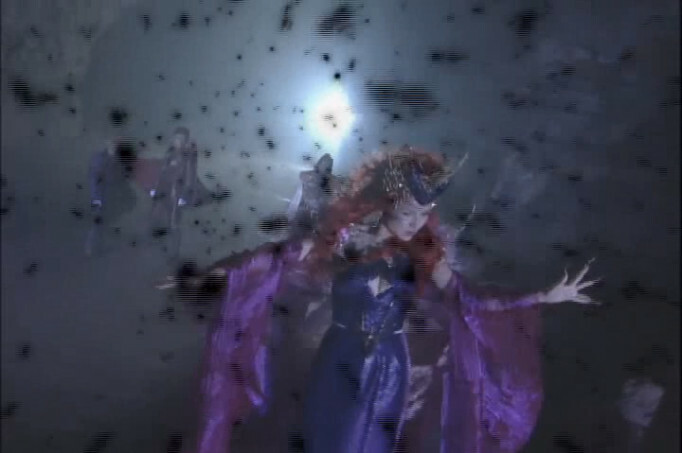 ...Queen Beryl is having to manage unruly bickering heavenly kings. Nephrite is grovelling over his latest failure, and Kunzite is rubbing it in with the success of his energy farm. (Scene of people wandering through a shopping mal in a zombie-like state). Streams of pink life energy are extracted from the prisoners, and sucked into the ventilation system. ...where ANT-LION BERET directs the flow. ...to the THE DARK KINGDOM! Kunzite looks suitable please with himself. She spots Naru coming the other way! ...a sinkhole opens in front of Naru. ...but she’s too late! Naru is dragged into the pit! Usagi and Rei run up (probably alerted by Rei’s youma-sense). Usagi collapses to her knees. They run to a shopping mall (or whatever that place is), meeting up with Luna. They spot Naru wandering, zombie like, at the top of an escalator. Ami and Usagi run to her. Usagi runs head first into the barrier! Luna suggests that if they all three combine their power, maybe they can break the barrier. Unfortunately, it doesn’t work, and all three are sent flying. 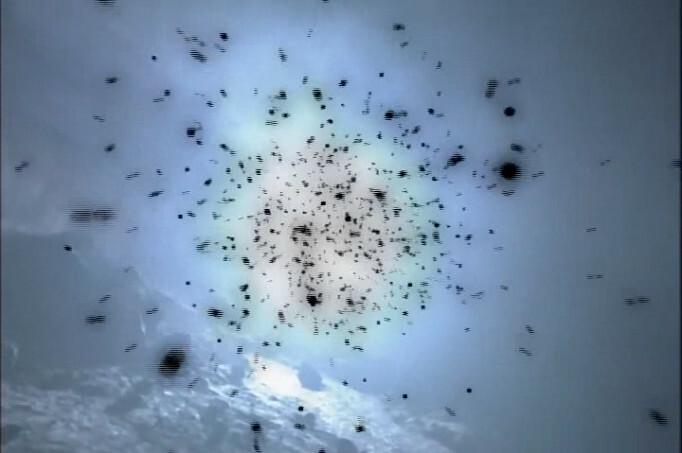 They try again, and again the backblast sends them all flying. 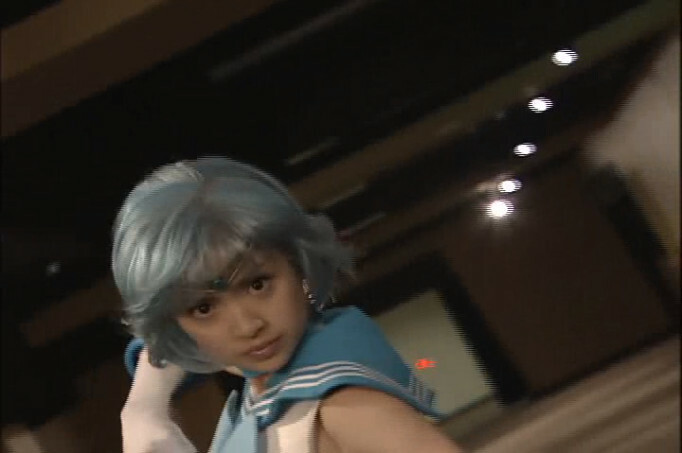 Sailor Mercury just keeps trying. Leaving Sailor Mars and Sailor Mercury to have a heart-to-heart. Ami’s feeling guilty for letting Naru get captured in the first place. (Although I don’t think there’s anything she could have done really, it all happened rather fast). ...also, she’s been feeling rather jealous of Naru’s friendship with Usagi. (Which, I think, explains some of what’s been going on with her over previous episodes). ...at some level, she wanted Naru to disappear. 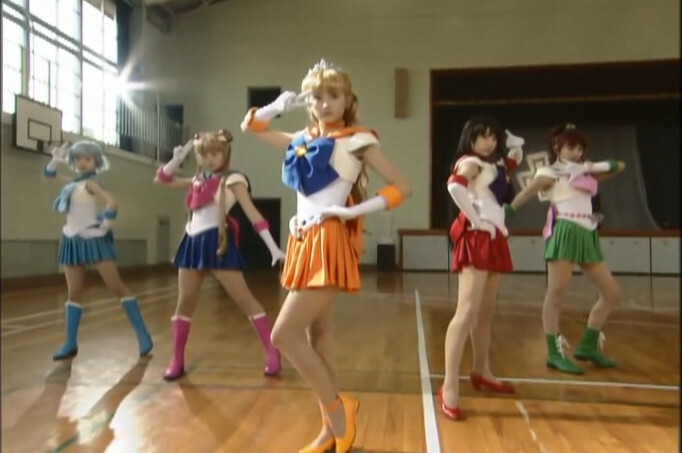 Cut to… Sailor Moon running through the streets. Rei’s pretty much running at maximum intensity here. Sailor Moon returns, with Sailor Jupiter. Unfortunately, with the barrier broken, the energy drain goes out of control! Drained, all of the trapped prisoners collapse! The Sailors run off in search of the youma. Unfortunately, the youma finds them. Punches Sailor Jupiter in the face! Punches Sailor Mars in the face! Kicks Sailor Moon in the face! ...then Sailor Mercury leaps over the youma, giving it an en-passent boot to the head. ...then obliterates it with Mercury Utility Fog Aqua Mist. The other three Sailors stagger to their feet. (Looks like Sailor transformations don’t cure illness in this version). ...which sets off Sailors Moon and Mercury. Sailor Mars watches Sailor Mercury laughing, and smiles. The various victims recover, getting to their feet and looking confused. Naru recovers, getting to her feet and looking confused. The students are instructed to get into groups of two. Ami, however, has her own idea. The two start baking cookies together. Later, with the cookies backed, the girls are labelling them to give to others. Ami (and I had to look this up) is giving hers to her mother. Naru teases Usagi that she is giving hers to her boyfriend. ...maybe (although Usagi denies it). ...but outside, lightning flashes, ominously. ...and that is not the only place ominous lighting is striking! Nephrite likewise is looking anxious. 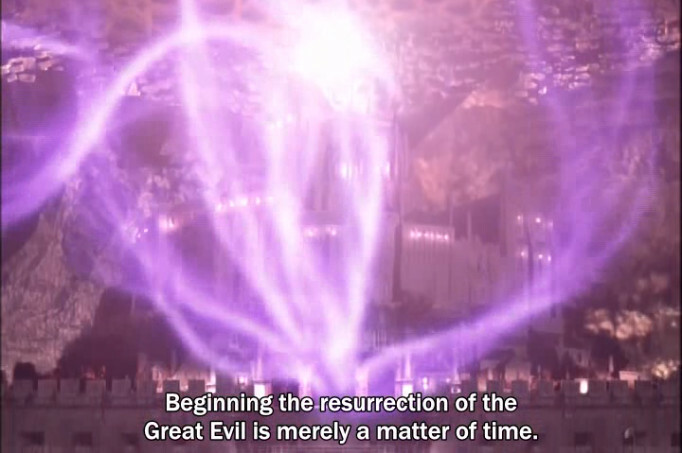 (I think this is the first time the Great Evil has been named). OOC: Nephrite: "Oh, marvellous, he's going to be even more insufferable now." THE DARK KINGDOM! is racked by an earthquake! ...and, in time with the pulsing, unearthly moans are heard. 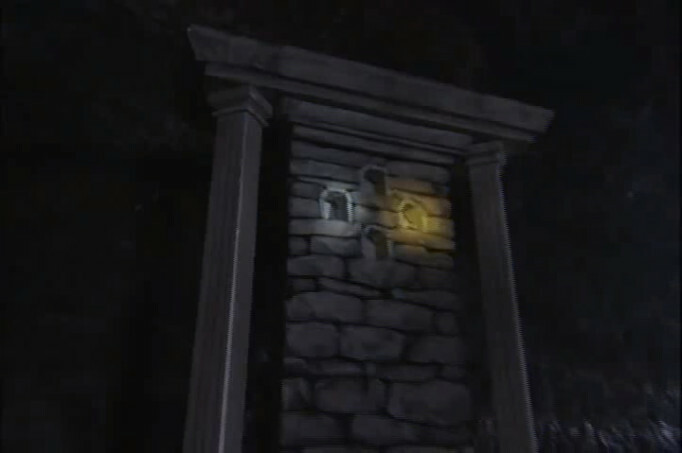 Within two of the niches lie stones. 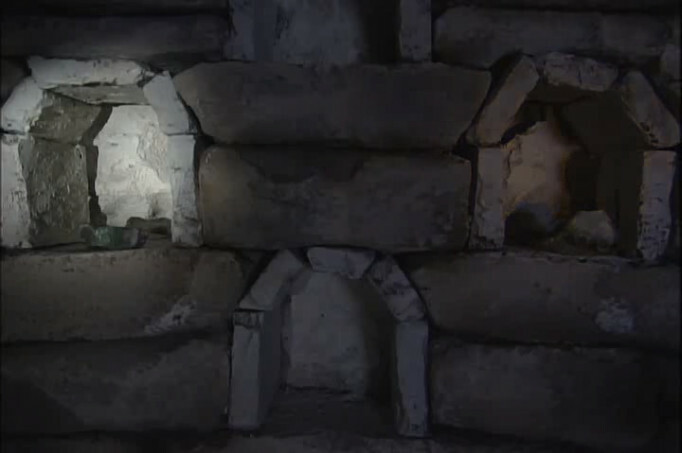 The stone in the glowing niche falls out, glows, and expands into a statue of a kneeling man. A wave of colour washes over, as stone turns to flesh and cloth. 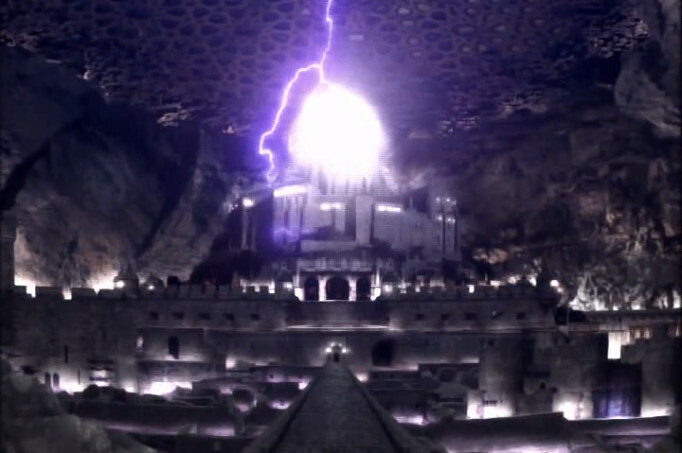 The lightning continues to strike, transitioning to Usagi, carrying a bag of cookies to Mamoru’s place (address provided by Naru last episode). Mamoru lives in a tower block. ...arm in arm with an unknown girl. ...then he and his companion walk on. A cold wind starts to blow. 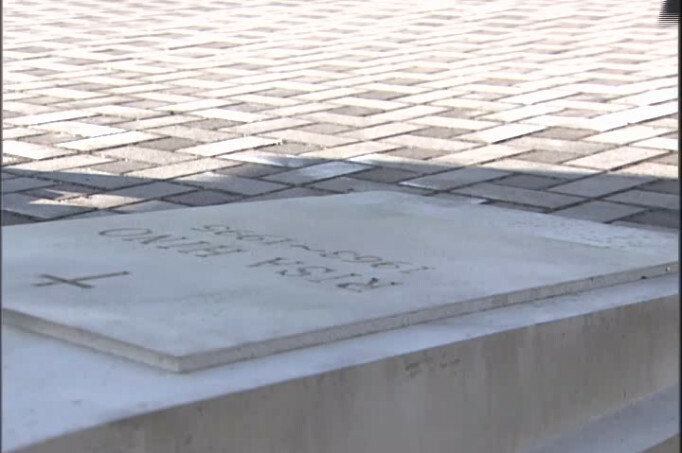 (Oh, I’m sure that’s not symbolic of anything). Usagi heads home, looking… less than happy. ...and I don’t think the situation re. Her and Naru is resolved, just out in the open (-ish). Does Mamoru’s mystery girlfriend have anything to the promise he mentioned on the phone in the previous episode? 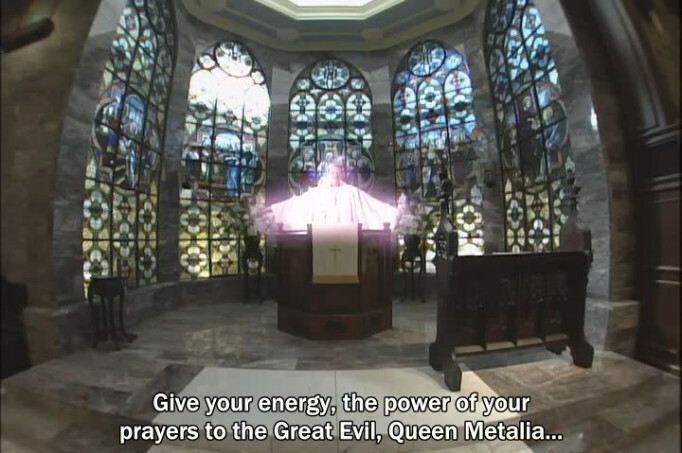 But… Queen Metalia is, if not awake, definitely stirring in her sleep. The Dark Kingdoms numbers are back up to 3 (out of 4) Heavenly Kings, which is as high as it’s ever been. ...oh, and we might well have a ‘new and improved’ Jadeite. Whew, yeah, now I think the show's starting to deliver the layers of drama I remember it for! I'm not sure that I ever did fully grasp Kunzite's motivations, honestly. 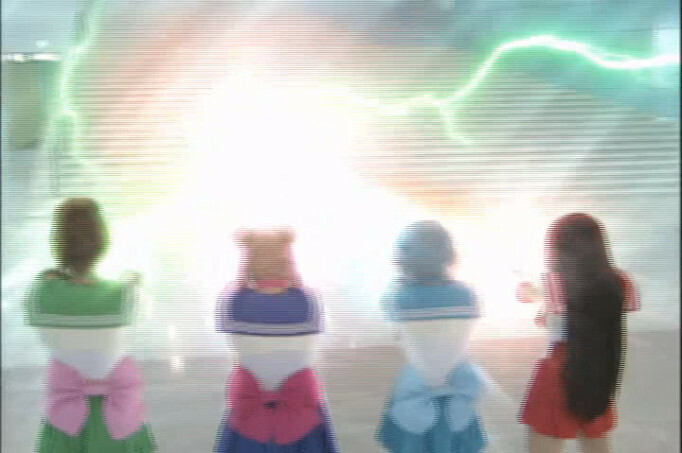 I do recall one blogger using the Mars/Mercury conversation in this episode as an example of how much Miss Dream mangled the translations sometimes. Whew, yeah, now I think the show's starting to deliver the layers of drama I remember it for! …and Minako continues to be unimpressed. ...also, questions of a religious nature. Go on show, rub it in! Usagi wanders the streets, unhappy. She starts eating the cookies. Her disconsolate reverie is interrupted by a news flash! Not to worry, Mina fans, she’s just recharging in preparation for her new album. Minako is having a drink of water, while Artemis monitors the news. She clutches her head and collapses on the sofa. Meanwhile, at school, the class is split, one half is to make a one-piece dress, the other half, (which includes Naru and Usagi) is to knit a scarf. Cut to… Sailor Command Centre. Ami is making a red scarf for her (yet to be seen) mother. Suddenly, her face lights up with a huge grin. Usagi proceeds to go hyper. Mako decides that someone needs to keep an eye on Usagi. Ami reveals that Rei isn’t coming in today, as it’s the anniversary of her Mother’s death. Rei lays a bouquet of white flowers on the grave. A priest offers his condolences. Then critically fails his diplomacy check. (Ok, that definitely looks like a Roman Catholic priest – which raises questions). (The last like I experienced this level of theological dissonance was the Masaki family (and guests) saying grace). (Dammit, she looks like she’s near to tears). The priest, perhaps realising his goof, pats her reassuringly on the shoulder and beats a hasty retreat. 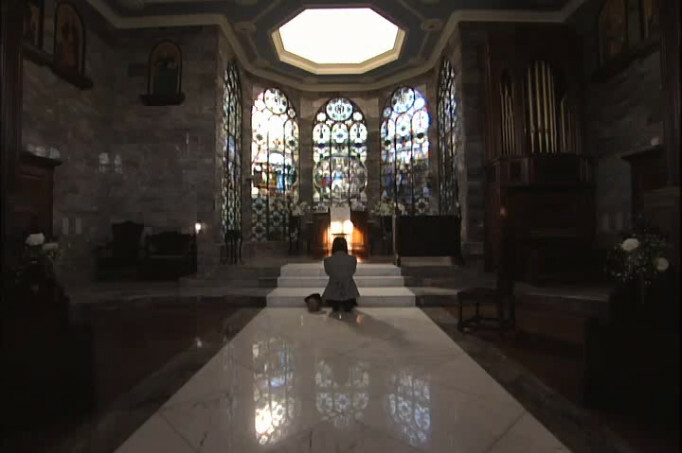 While, in the church, another girl kneels in prayer. 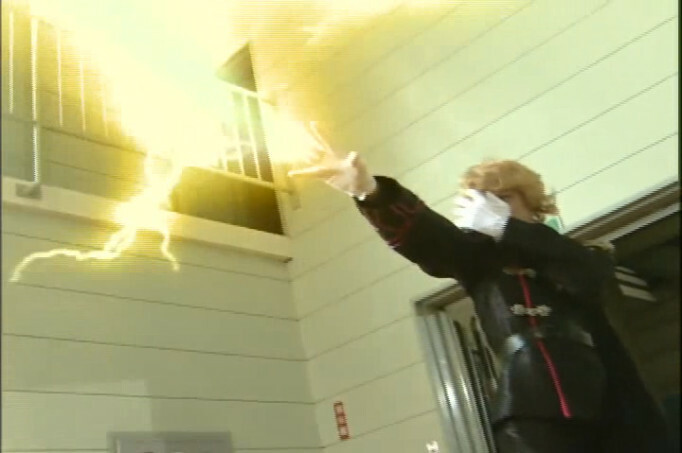 Nephrite is bringing Jadeite up to speed. 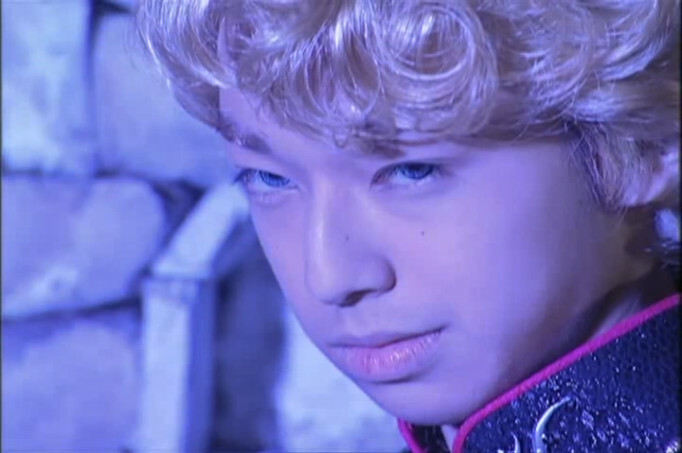 Nephrite opines that maybe Kunzite seeks to take Queen Metalia’s power for himself. I'm not sure that I ever did fully grasp Kunzite's motivations, honestly. Well, Nephrite thinks he might be angling for some sort of coup, but frankly, he’s a bit too open in his contempt for the rest of team Dark Kingdom. Another possibility, which matches his observed behaviour so far, is that he is a true believer, who’s only interest is in resurrecting Queen Metalia, without regards for whatever plans the rest of the Dark Kingdom has. Now, I wonder, what does Queen Metalia think of all this? Mako manages to catch up with Usagi, but is not making any headway in convincing her. Usagi goes shopping for wool, imagining giving Tuxedo Mask a scarf made in each colour. (She’s just not taking any notice). Usagi finally decides on white wool for the scarf. The priest calls for aid, Mina goes to assist, Rei, overhearing him, joins them. The priest has found abandoned dog. Minako and Rei rush to assist. ...at which point, Minako recognises Rei. They bring the dog indoors and try and warm it up. The priest gets called away by a nun, the two girls volunteer to looks after the doggy. Usagi starts having Mamoru flashbacks. Usagi rushes off, scattering the pigeons. While caring for the doggy, Rei notices something. She looks at a magazine, then looks at Minako. She picks up the magazine, on the cover is a picture of Minako. OOC: I can’t help but think that Minako’s probably thinking ‘couldn’t you guys keep her slightly better focused?’. 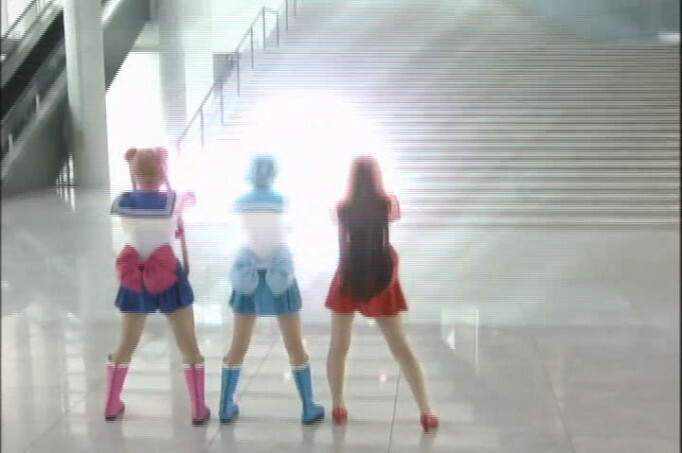 Cut to Sailor Command Centre, where Usagi is belting out C’est La Vie at maximum volume. Watched by a slightly concerned Mako and Ami. Minako continues to stroke the doggy. Minako looks pensive, Rei watches Minako, intently. The two girls share some throat lozenges Minako found in her pocket. 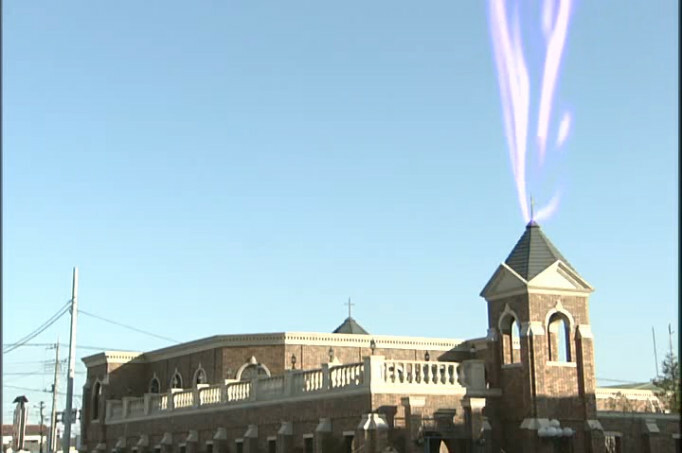 Outside, the priest gets jumps by a youma. Tentative Nomenclature: Well, it ain’t Boxey. Zorrina, perhaps? Capabilities: Light-rapier, Lasers, Rapier Missile. Rei senses something amiss, and rushes outside to investigate. OOC: I just need some air, and totally am not going to transform and fight a supernatural gribbly. Minako, of course, figures out what’s likely going on immediately. 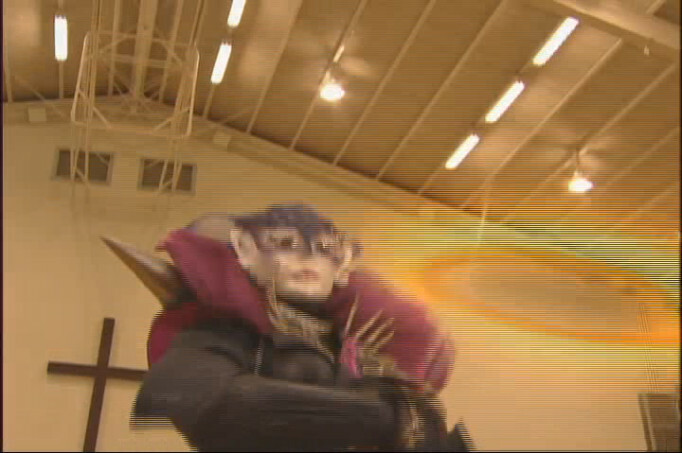 Rei finds MASQUED SWASHBUCKLER standing over the unconscious priest, and transforms. 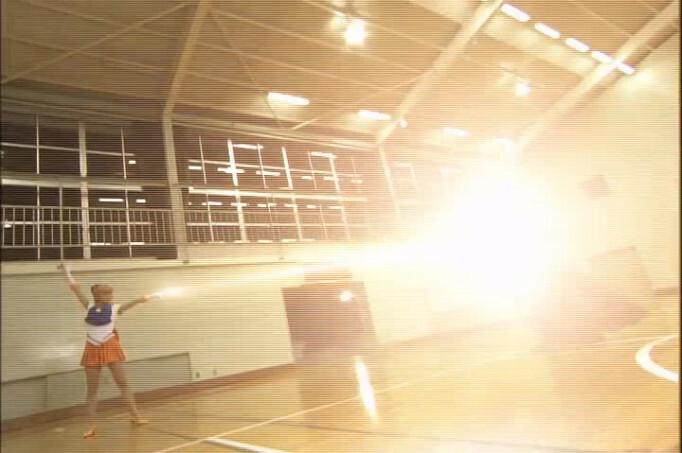 ...and promptly chucks a fireball at her. MASQUED SWASHBUCKLER dodges, and runs off. Minako runs after both of them. Usagi, Ami and Mako are out walking. Usagi boasts that this scarf will be ideal for Tuxedo Mask. Mako points out that’s she’s barely started it. ...when all their lunaphones ring. The three rush off towards the church. ...and ploughs (predictably) into Mamoru. ...who is still with Mystery Girl (I do hope we get a name for her). ...at which point, everything grinds to a halt. Ami and Mako look at all three of them. Mystery Girl suddenly spots that Usagi’s dropped her knitting. ...picks it up and hands it back to Usagi! Ami and Mako continue to look at the three of them. Ami and Mako run after her. Ami gives up the chase with a forlorn ‘Usagi’. Mako finally catches up to Usagi. 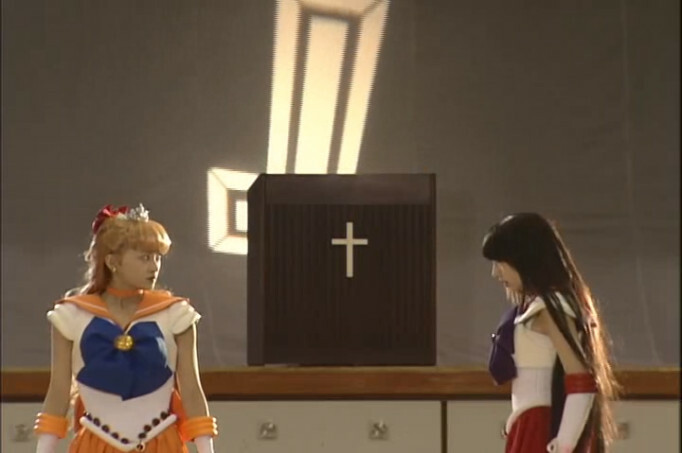 Back in the Church, Sailor Mars chases MASQUED SWASHBUCKLER onto the stage, and into the hall. MASQUED SWASHBUCKLER draws a rapier, and battle is joined. 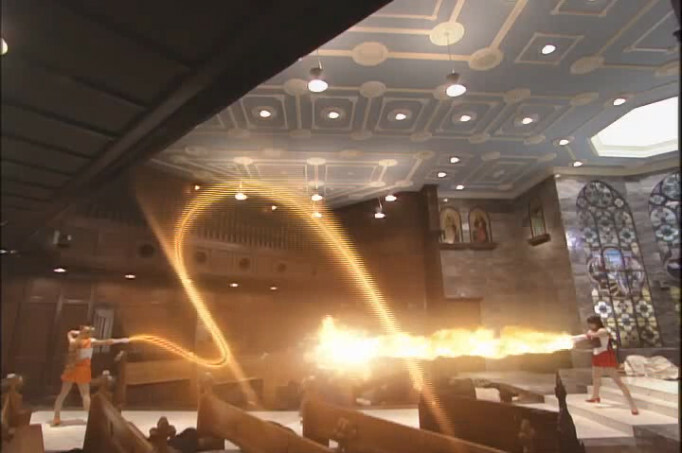 Sailor Mars throws another fireball, which MASQUED SWASHBUCKLER again dodges (fortunately, the FX budget does not cover destructible terrain, or the Church would now be on fire). Battle is joined, kicks vs. sword. 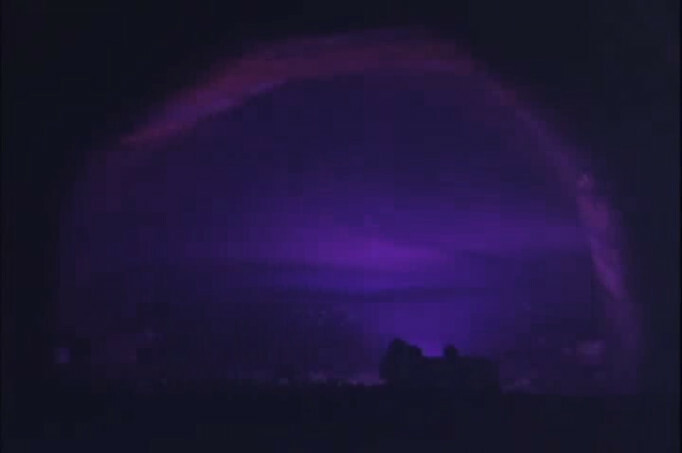 MASQUED SWASHBUCKLER’s sword carves lines of glowing purple in the air. ...and fires a frikkin’ LASER BEAM! Minako arrives on the stage, taking in the situation in an instant. ...ok, that’s the fanciest transformation sequence yet. Lots of gymnastic moves and effects! As the two Sailor engage MASQUED SWASHBUCKLER in battle the show decides that it is the perfect time to cut to Usagi and Mako. Usagi gloomily looks at her knitting. Ok, enough of that, back to the action. The two Sailors circle round MASQUED SWASHBUCKLER, who is mostly keeping her attention on Sailor Venus. Sailor Venus attacks with her crescent cutter, which MASQUED SWASHBUCKLER parries. Usagi walks sadly down a road. ...then blasts her with a Crescent Beam! MASQUED SWASHBUCKLER is staggered, then throws her rapier at Sailor Venus. Sailor Venus is sent flying. MASQUED SWASHBUCKLER runs for it. Sailor Mars runs to her aid. Sailor Venus gets to her feet, imperiously. Ok, as I mentioned, so many feels. The Usagi and Mamoru situation is now just a bit messy. Rei and Minako are clashing head on - and I don't see either of them backing down. And what is wrong with Mina? simple exhaustion due to her double life of pop idol and superhero? Jadeite is back! And he and Nephrite have decided to bury the hatchet (preferably in Kunzite). And, in a universe next door. (Also, we finally get a name for Mamoru’s mystery girlfriend). No real re-cap, just a reprise of the battle at the end of Episode 17. Sailor Venus leaves in a huff. Later, in a taxi, Artemis talks with Minako. As she had been keeping her true identity a secret from the Sailors, why did she reveal it now? Suddenly, her vision goes blurry as she clutches her head. While, in THE DARK KINGDOM! Naru senses something is wrong. Mamoru continues to be a subject of discussion, this time with Ami and Makoto. Usagi admits that, all along, she’d be knitting the scarf for Mamoru. Makoto tries to convince Usagi not to give up, and Mamoru is a much better boyfriend candidate than that Tuxedo Mask person. Makoto declares her intention to dig up some information of Mamoru’s girlfriend, and cannot be dissuaded. Cut to… St. Juban’s Church. Rei arrives by bike, with a large sack of dog food. Minako and Rei exchange a glare. Minako notices the sack of dog food. Minako gets back in the taxi. Rei vs. Minako: 1 point to Rei. Rei feeds the doggy (who she calls Tarou), who continues not being a shape-shifting monstrosity. The priest is grateful as well. Minako arrives burdened with four large boxes of canned dog food! Rei vs. Minako: 1 point to Minako. Minako calls the dog Ricky. The priest mentions that they still need to find the doggy an owner, he’s planning to make an announcement during morning Mass. Rei has an idea, she’ll make some posters. 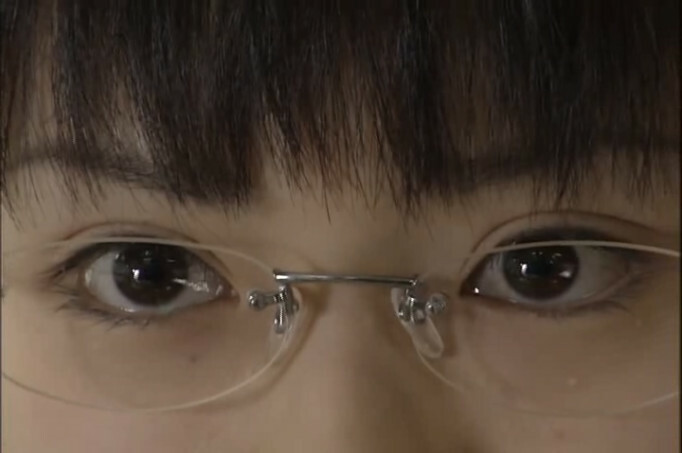 Minako leaves, Rei glaring after her. And, atop a skyscraper, MASQUED SWASHBUCKLER paces menacingly! ...turns out Mamoru’s mystery girlfriend is named Hina, and she’s from a very prestigious family. Mako tries to make it up to him by offering him a large tray of buns. ...and some high-grade turtle food. Verily, the way to a man’s heart is through his turtle. Motoki jumps to a conclusion. Later that night, we cut to the couple under discussion. Hina wants Mamoru to take her to Mass. She’s been past that Church many times, and she want to get Married there. 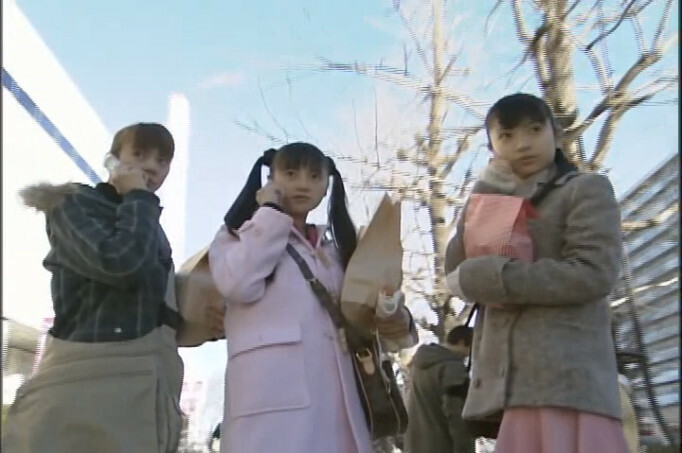 Cute flashback; Mamoru and Hina as children. Meanwhile, Usagi (in her pyjamas) is knitting. Flashback; several of her encounters with Mamoru. 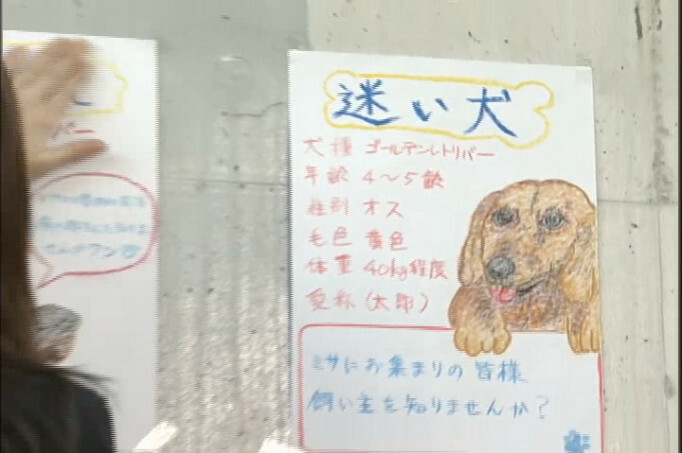 Elsewhere, in a hotel room, Minako is working on a huge doggy poster. She looks at the poster, where she had written, in large, friendly letters, the word ‘Mass’. Sunday morning, St. Juban’s Church. The worshippers arrive, Mamoru and Hina among them. Rei is putting up ‘have you seen this doggy’ posters. Minako putting up a much bigger poster. Minako goes straight to the point. She taps the word ‘Mass’. The worshippers file into church. Mamoru and Hina are sitting at the back. At Sailor Command, Mako discusses the Hina and Mamoru situation with Ami, and is wondering how she’ll break the news to Usagi. Usagi is lying in bed, listening to the beat of her heart and thinking of Mamoru. Hang on, that’s not a heartbeat, that’s her lunaphone! Mako and Ami also get the call. No… that’s not a typo. MASQUED SWASHBUCKLER manifests, the priest slumps to the floor, and MASQUED SWASHBUCKLER starts draining energy from the congregation. 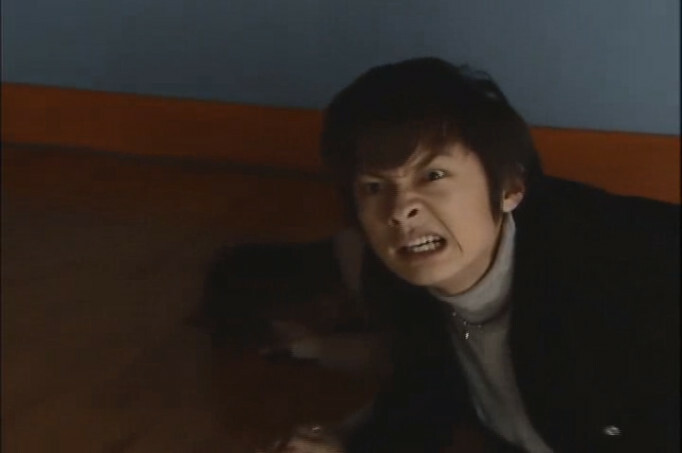 Mamoru recognises the danger, manages to wake Hina, and they run for it. ...with MASQUED SWASHBUCKLER in pursuit. While, in the church, MASQUED SWASHBUCKLER corners Mamoru and Hina on the stage. The youma fells them both with a swipe of its rapier. Hina is out cold, while Mamoru, still conscious, glares at the youma with a hate-filled grimace! ...which turns to surprise as the four Sailors rush in. Sailor Moon is shocked to see him. MASQUED SWASHBUCKLER manages to deflect the attack. His attack sends all four Sailors flying. Then they notice he is not alone. MASQUED SWASHBUCKLER joins the two heavenly kings. Battle is joined – it is not going well for the Sailors. (Remember, when they last fought him, Jadeite was winning in a 1v2 fight, and was only stopped buy an unexpected heart attack, while Nephrite could hold his own in a 1v2 battle, and now they have a youma back-up). The opening music plays as everyone looks at her. Sailor Venus jumps down, exchanges a meaningful look with Sailor Mars, and a less meaningful look with the other Sailors, and the five form up. After the Sailors dodge the Heavenly King’s blasts, Sailor Venus runs for the door, with MASQUED SWASHBUCKLER in hot pursuit. Sailor Mars runs off after Sailor Venus and the youma. Jadeite and Nephrite attempt to pursue Sailor Venus, but their way is suddenly blocked by Sailor Jupiter and Sailor Mercury. 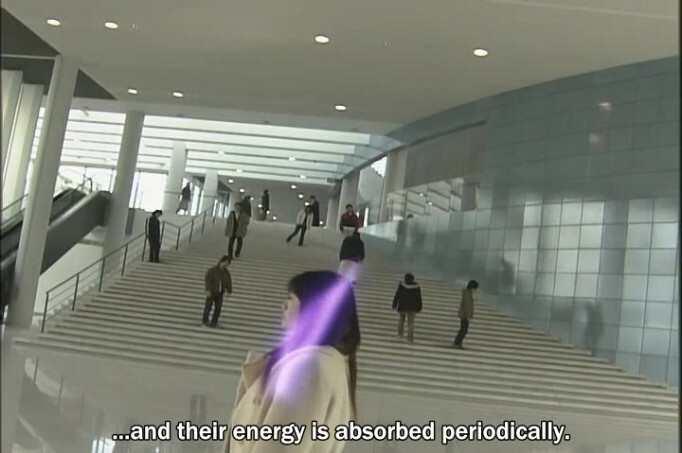 ...the is an exchange of energy blasts. Sailor Venus is hit, she goes down! Sailor Mars arrives, and distracts the youma long enough for Sailor Venus to regain her feet. She then somersaults over the youma. Sailor Mars winks at her. Sailor Venus returns the wink. ...the other three Sailors are not doing to well. Sailor Moon: “I thought you meant...” gestures right forehead. Jadeite suddenly realises the odds are no longer quite so much in his favour. Jadeite decides that discretion is the better part of valour. With a swirl of his cape, the two vanish. 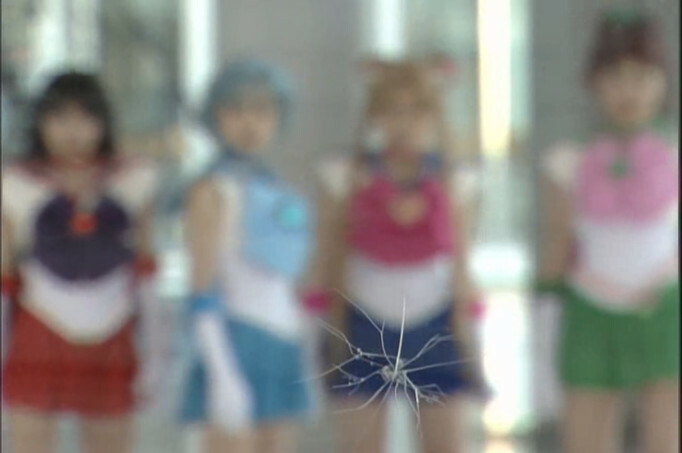 Sailor Moon turns towards the stage. (Interesting how she specifically mentions Sailor Moon there). Sailor Mars gets it, but she’s not happy about it. Back in the hall, Mamoru and Hina lie unconscious on the stage, holding hands. She kneels, and heals the two with a golden glow. ...when he turns back, the stage is empty. 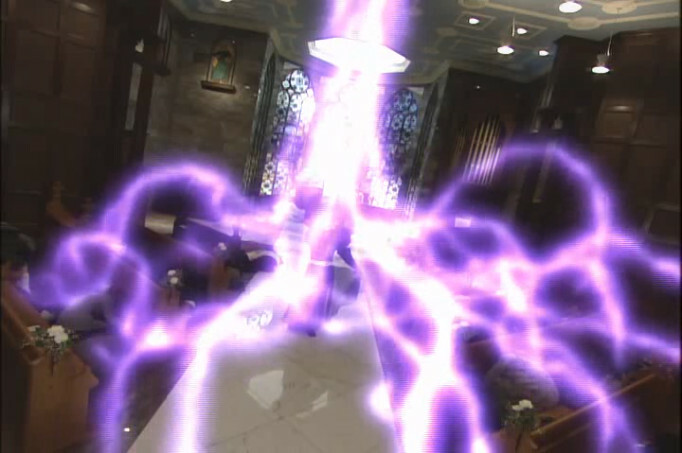 Mamoru and Hina rush into the nave, where the congregation are coming round. Later that night, it seems that doggy has found a home, and is being collected by a father and child. Rei thinks on her order from Sailor Venus. The subject of her ponderings is, again, changing hotel rooms. Artemis is finding it tough. She smiles a sad smile. ...and a sound, like listening to a sea-shell, but… off. Behind her throne, this appears! (Let us hope there is not a massacre). Ok, looks like there’s a reason for Minako keeping herself aloof. Rei may have figured out part of what Minako’s up to. 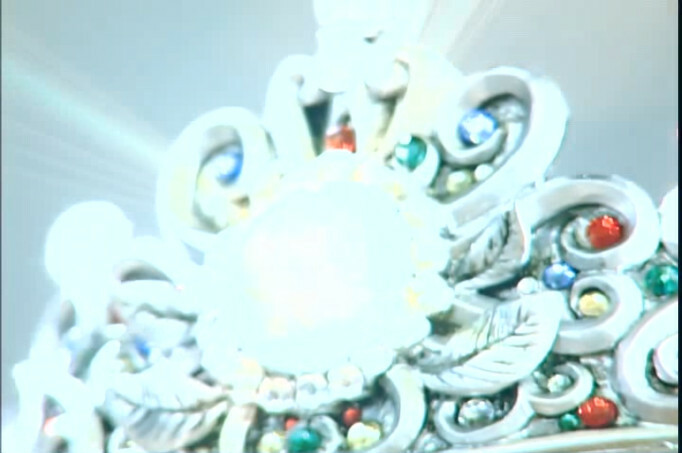 ...and Queen Metalia is waking up. ...and there are 30-odd episodes still to go! So Sailor Moon's romantic rival is not Hino but Hina, yet could the "hi" refer to the sun either way? ...Now who has more points between Rei and Minako?